Help, I Need To . . .
CSTAR Animal Care offers different types of low-cost clinics as part of the Spay Our Strays Clinic program. Learn more about which clinic is right for you, and then check out CSTAR's upcoming Spay Our Strays Clinic dates below. Don't forget to schedule an appointment in advance to bring your cat or dog to one of our clinics! Help us spread the word about the availability of these crucial low-cost services. Download our latest SOS Clinic flyer with upcoming clinic dates, and ask local businesses such as libraries, post offices, laundromats, schools, medical offices, supermarkets, and pet food stores if you can display our flyer on their community boards, doors, or windows. You can also download a version of our flyer without any dates that can be displayed all year round. 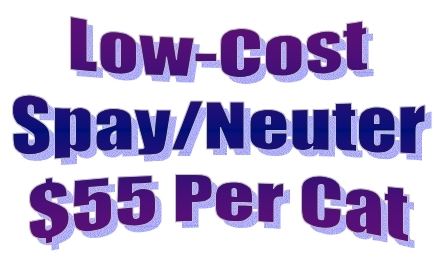 Cat spay/neuter surgery as well as cat and dog vaccines and other services are offered at the low-cost, high-volume Mega Clinics, which are held on Sundays at our new clinic location in Somerdale, NJ. The exact address, map, and directions can be found here. Appointments are required for all services at our mega clinics, and deposits are also required for all surgery appointments. Please remember, cats must be in secure carriers (no cardboard carriers), and dogs must be properly leashed or in secure carriers. Cat and dog spay/neuter surgery, vaccines, and other services are offered at the low-cost Mini Clinics, which are now held on Sundays instead of Saturdays, at our new clinic location in Somerdale, NJ. The exact address, map, and directions can be found here. Walk-ins are welcome for all services except spay/neuter surgery at our mini clinics from 1pm until 2pm. You may schedule an appointment in advance for faster service on the day of the mini clinic, but appointments are not required for non-surgical services at our mini clinics. Appointments and deposits are required for cat and dog spay/neuter surgery at our mini clinics. Occasionally, CSTAR may offer off-site spay/neuter and/or vaccine clinics in other communities as either standalone clinics or as part of other events. Information about these clinics will be posted on the SOS Clinic home page when a neighborhood clinic is scheduled. There are no neighborhood clinics scheduled at this time. Please view our monthly mega and mini clinic dates for your pet's spay/neuter and vaccination needs. *Neighborhood clinics are usually coordinated in a joint effort with township administrators, rescues, or other groups as additional resources are needed, including a building to use as the clinic's location, advertising, and a minimum number of cats in attendance. For more information on hosting a neighborhood clinic, please contact CSTAR at (856) 537-8729. To view more information about CSTAR Animal Care, the Spay Our Strays Clinic, upcoming events, lost pets, integrating new pets, alternatives to declawing, ways to make a difference and save a life, and more, visit both www.cstarnj.org and www.sosclinic.org.